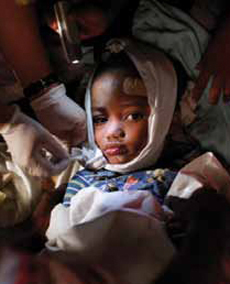 On January 12, a massive earthquake struck the island of Haiti. New Orleanians, more than anyone else in America, understood what it was like to have their homes destroyed by a catastrophe. Both individuals and local nonprofits responded immediately. New Orleans Living spoke with two people involved in the humanitarian effort in Haiti. The first is Colleen D’Aquin, the Louisiana Catholic Diocese’s regional director of preparedness and response. What is the current situation in Haiti? The organization that represents the Catholic community there is Catholic Relief Services (CRS), so all the reports that we get are from CRS. At this point, they’re saying that 800,000 people are estimated [to be] living in temporary shelter sites within Port-au-Prince; 500,000 are migrating from Port-au-Prince to other areas of Haiti. That is increasing needs in other areas as well. At this point, the government is saying 150,000 people have perished, but they’re estimating that it could go up to 200,000. What assistance has CRS given to the people of Haiti? CRS is the lead agency in two of the temporary shelter sites, so they’re coordinating food distributions, water distributions and sanitation services as well as medical care. Not only do they have services in these two sites, they also have 50 different churches where they’re setting up sites. One of the critical things is that they’ve partnered with the Maryland University shock trauma team. They have 22 people that have gone to provide surgery, and they’re running three operating rooms. Beyond food and medical care, what are the other immediate needs? The big concern is that they’re coming on the rainy season. We’ve got people in these tent cities, if you could even call them tents. They’re looking at transitional housing and devising plans for more appropriate housing. How long will Haiti need assistance? I think it’s going to be years. Their infrastructure was so poor to begin with, and it will really depend on how organized they can get their government. How can people in New Orleans help? At this point we’re still recommending cash donations. The organizations don’t have the time and capacity to box things up. It’s easier for them to purchase these items in bulk, they can get them for 75 percent less than you and I can, and they are shipped directly to the country. I have also seen a lot of need for doctors, nurses and people in various medical services. How has the local archdiocese coordinated relief efforts here in New Orleans? Primarily, we are focusing here on the local Haitian community to provide counseling, pastoral care and work with them to determine their needs. And we are working with our immigration and refugee services on the temporary protection status. How have New Orleanians reacted to the crisis? From what we’ve seen so far, the people of New Orleans have been fantastic. Our phone is ringing off the hook with people who want to assist, who want to adopt orphans. The Washington, D.C.–based charity Share Our Strength (SOS) works to end hunger across America and around the globe. After Katrina, the organization established an office in New Orleans to help with our recovery. In January, the group’s founder, Billy Shore, visited Haiti to survey the situation and distribute emergency food supplies. “In our work I’ve often seen gratitude from families receiving meals,” he wrote. “What I’ve never seen before was the panic on the faces of so many people who knew better than I did that the food would run out before we’d served even a fraction of those who’d had nothing but an energy biscuit or Power Bar in the 10 days since the quake struck.” Ashley Graham, the group’s Louisiana director, spoke about the long-term needs in Haiti. Over the long haul, what can groups like Share Our Strength do to help Haiti recover? There is a lot of talk about building deeper relationships with the homegrown organizations, so that when the international attention starts to wane, you’ve built capacity among the Haitian community organizations. What can we do here in New Orleans to help? There are three things. Obviously giving to whatever organization you feel most comfortable with. Dollars really are crucial, not only now but years from now. Two, you can go down on future volunteer visits in conjunction with a relief organization. Three, we will have some Haitian evacuees. We want to take care of the folks who have evacuated and the people who are from Haiti and are helping their families back in Haiti. How do you keep people focused on the situation in Haiti when the media moves on to another story? You have to rely on the intelligence and compassion of folks. I’m guessing it would be an easier sell here than other places in the country. We know firsthand that there will not be any overnight solutions. Share Our Strength came to Louisiana after Katrina. We made a decision that this was going to be a long-term investment. And we are making the decision as an organization to do the same for Haiti. For more information about the archdiocese of New Orleans, visit www.arch-no.org. To learn about Share Our Strength’s work, visit www.strength.org.